Prime conditions for the Black Beetle it wasn’t ! Headed for the sea after work on Friday, Pat and myself scouted a few preferred marks but we were disappointed to see heavy seas creating a lovely brown band reaching from the shore to approx 100 yards out. Varying wind direction made it difficult to assess the evening’s fishing. A call was made to try a mark that we very seldom fish, en-route we were joined by Barry & Crevan. 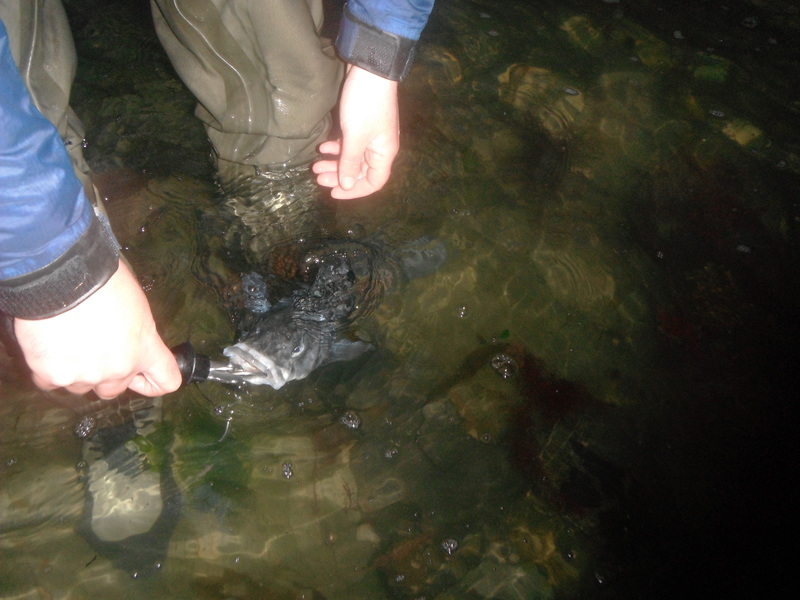 We made our way down to the water and fired out a few lures for the last of the rise into crystal clear water. We could see Gannets bombarding the water further out but our offerings were not touched for around 30mins or so. We made a move and fished on, this time encountering alot of suspended weed which helped the decision to move again. The wind had now changed direction to Northerly calming the sea some what, the inshore water in front of us appeared clear as we made our way down, we walked for a bit before splitting up, Barry & Pat taking a deeper vantage point, Crevan attacking a flooded reef while I ventured on to an isolated rock some distance away. It was cold and wet, and after 60mins I had 2 follows to show for my efforts, I could see see Barry & Pat now back up with Crevan as it was unfishable near the deeper water. I fished on working the lure as close as I possibly to a set of submerged rocks, the lure stops around 10 yards out and I knew it wasn’t stuck. Fierce head shaking followed a strong initial run before I finally landed the Silver. Happy out dot com !! 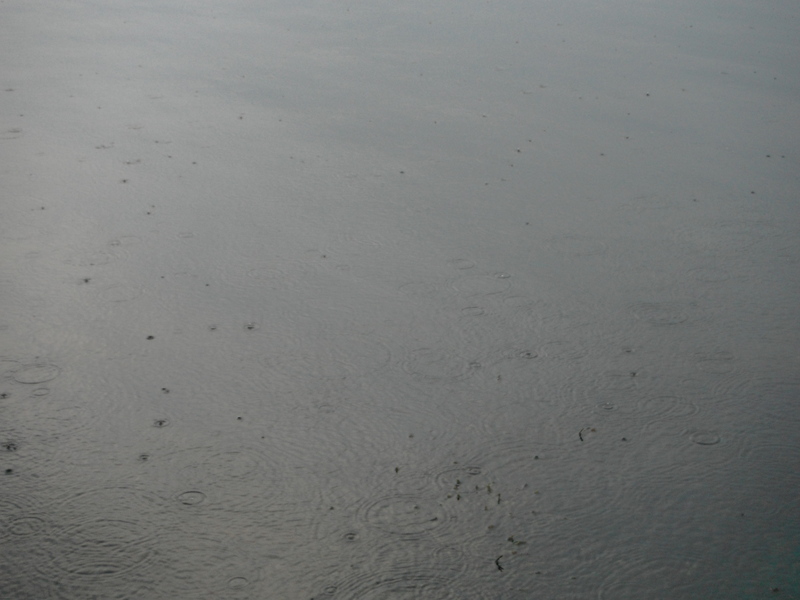 A Bass in tough conditions. 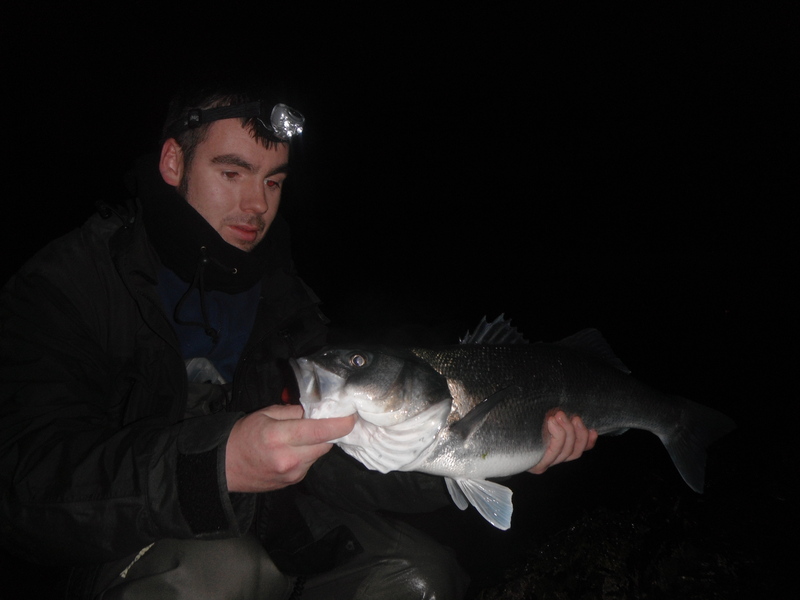 It was a reward catching it, you take for granted fish you catch on marks you are familiar with and it can ‘some times’ become a formality on such a mark, not this time. This is a mark I wouldn’t be too familiar with which made it even better when the Silver hit. 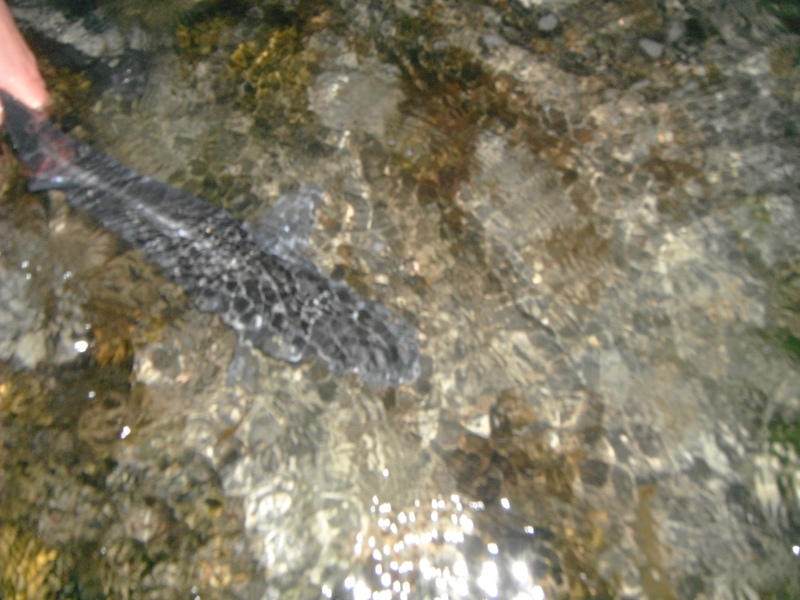 Both fish were very lean – possibly after spawing already. Taking under water pictures in April is not good for the hands. Tuesday looks like a good window ! Yor next one could be your best one. Since my last post we have been hitting the water at every opportunity with some fantastic results so early in the season. 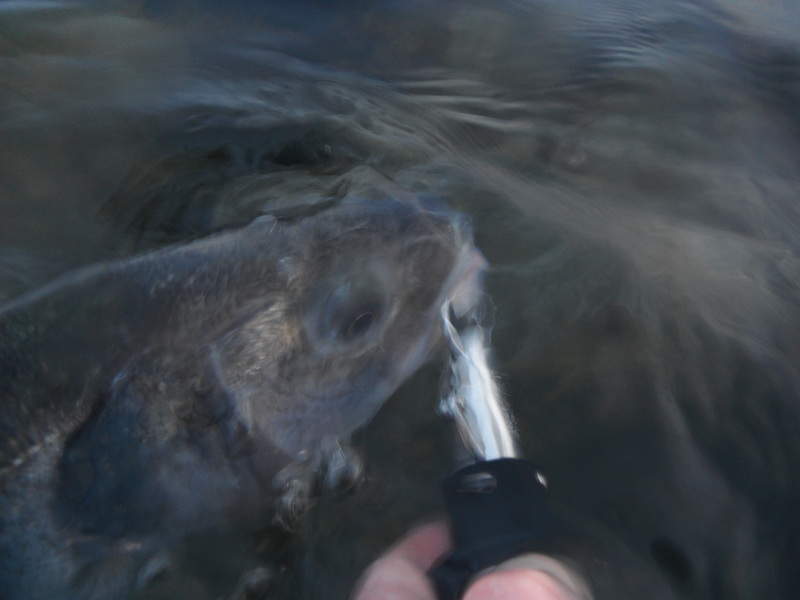 I had my first few Bass on a Hard Plastic over a week ago and they have been hitting them hard since, for now the Soft Plastics have taken back seat as we push on through April. Feed Shallow ready for action. The weather conditions have varied from bright sunshine without any wind, to heavy rain driven by a bitter Northerly wind. 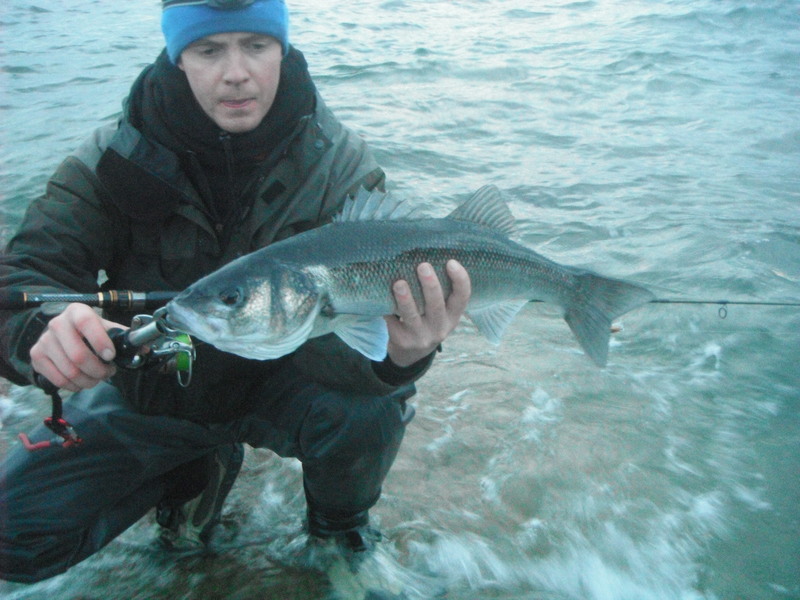 Fish have been caught through these varying conditions. Barry with his first lure caught Bass of 2012. Water clarity has varied from brown & murky to gin clear, we experienced good fishing when we found a happy medium between the two. 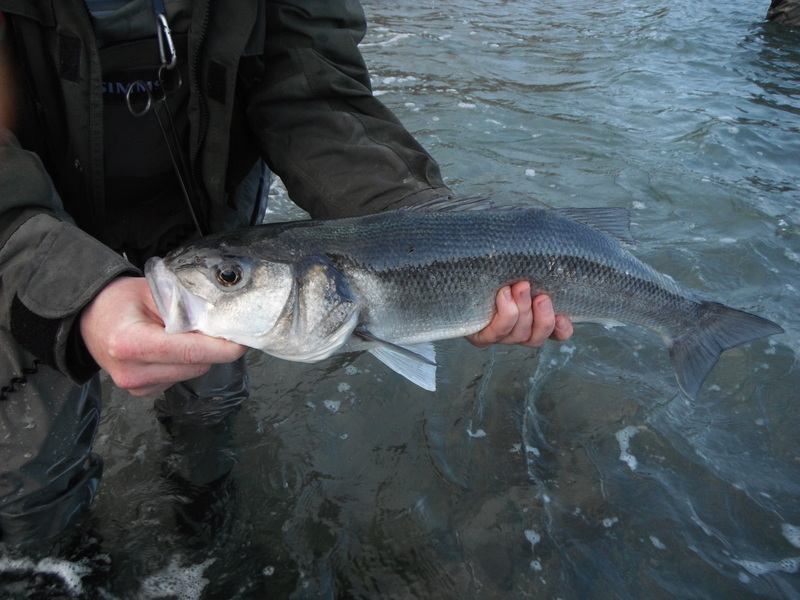 Mullet turning, Sea Trout jumping and Sand Eels swimming were some of the sights we encountered. 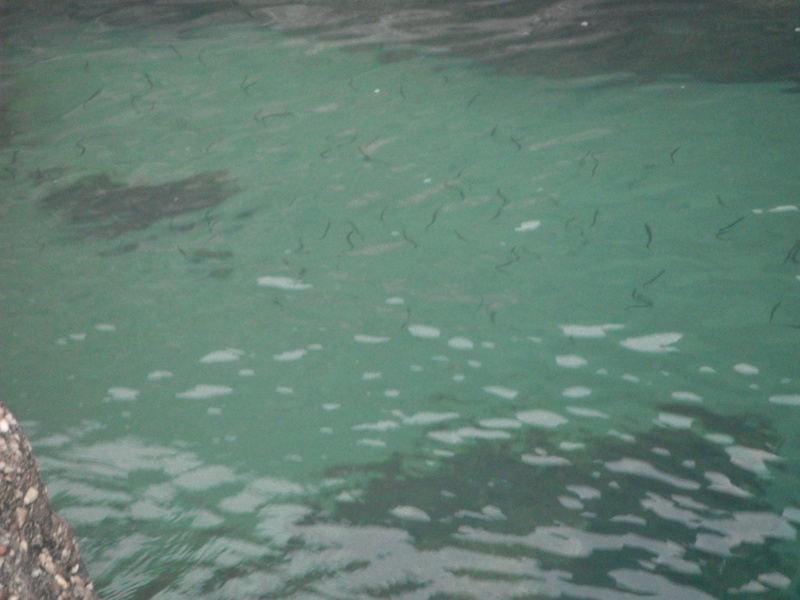 Sand Eels going about their business. Crevan with a fine bar of Silver. This Bass hit my lure while it was stopped. Head into the tide before the release. 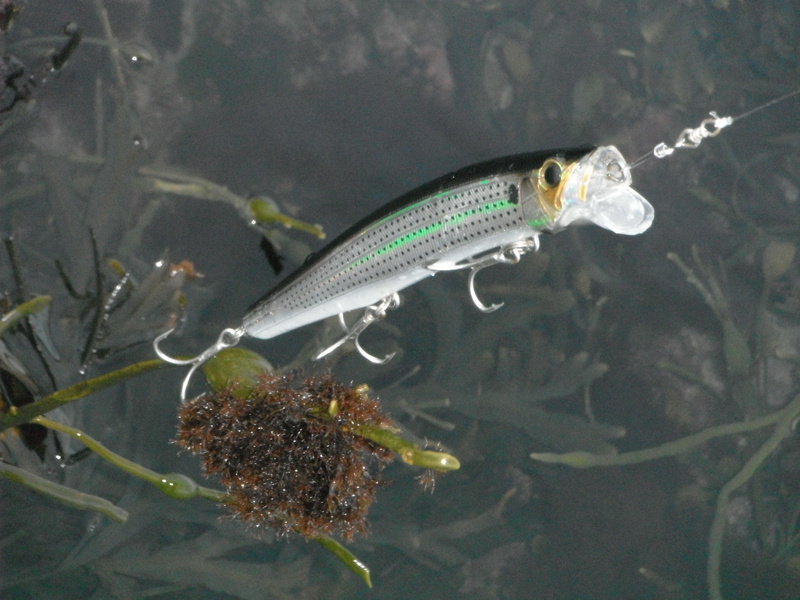 I was stood on a rock out crop working my lure slowly over a patch of clean ground to my right when I was hit hard, the fish felt strong as it headed out to sea taking 5 yards of line before turning left taking a further 10 yards of line. 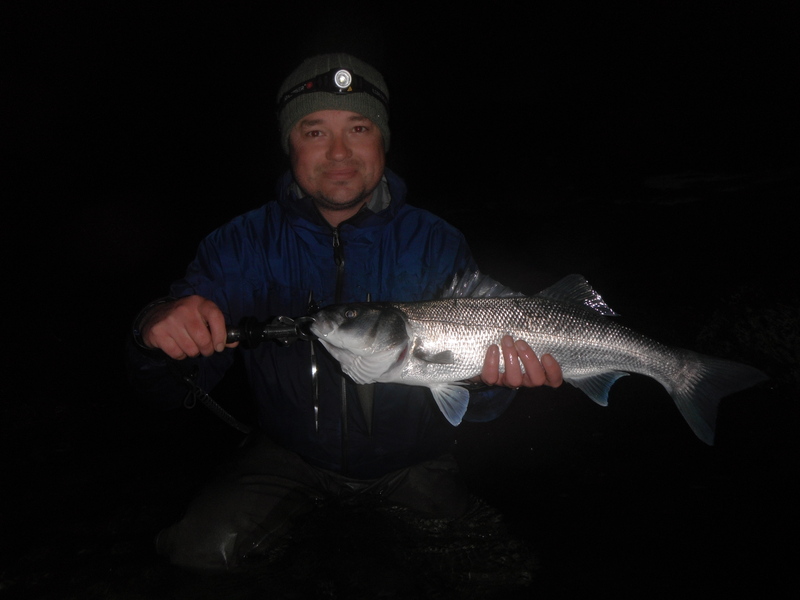 ‘This is a good fish’ I shouted to the lads who were fishing 20 yards to my left on another outcrop. The fish had the better of me as I could not get an angle on it with the rod looking like the letter C, the fish approached the two lads and ran over the shallow jagged rocks. I could feel every rock rub against the braid before I felt the ‘PING’ the main line immediately fell back and brushed my cheek. I stood there and vented, cursing my luck and explained to the lads how I lost the lure and the fish. 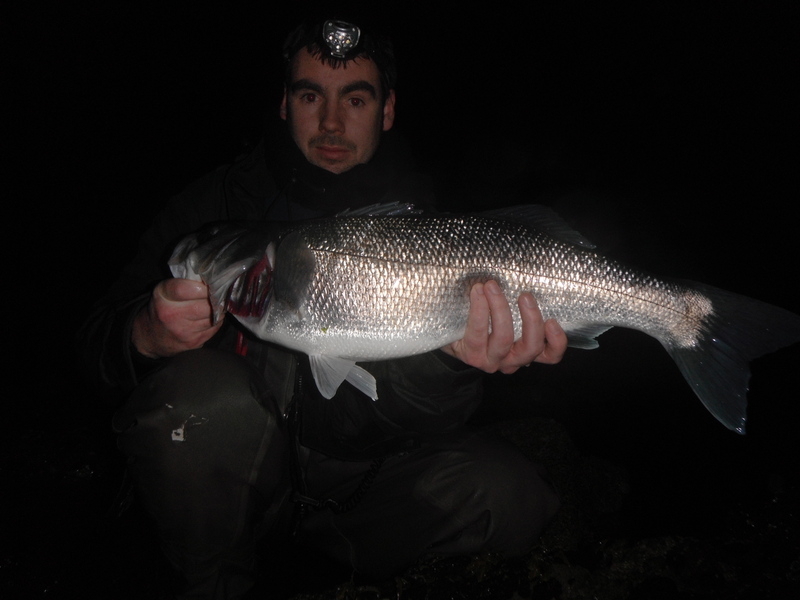 Danny with 7lb of Silver. An end to another tide. Your next one could be your best one. Low cloud cover with a light Northerly wind greeted us yesterday morning as the tide pushed in over the bladderwrack. 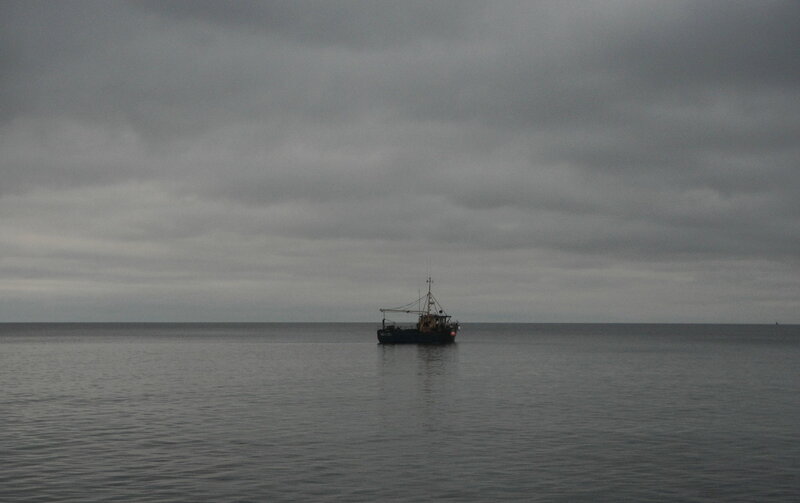 We would be targeting Wrasse for the first time this year, and what a still morning it was. Flat calm with gin clear water, I would have preferred a bit more motion in the water to fizz things up but we agreed that this has to be the most relaxing spot to fish on a calm day. Would have been a great morning for the boat. 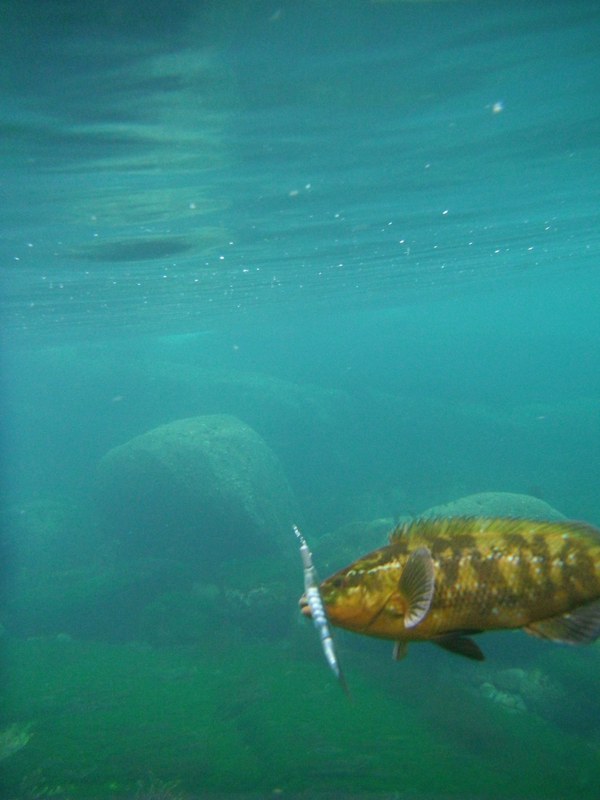 When targeting Wrasse I use jig heads (mainly Decoy Bachi) that have been used for my Bass fishing and are starting to rust/corrode. 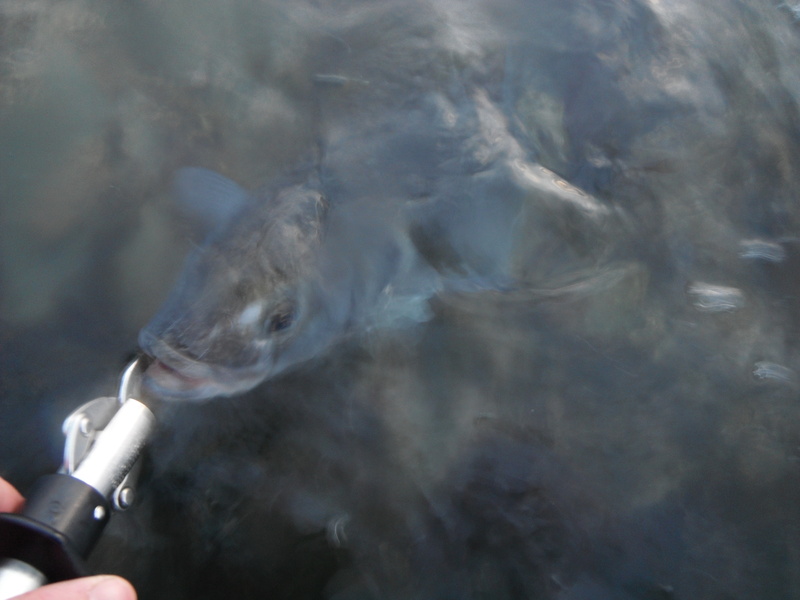 For the lure I used Soft Plastic that have been used and damaged while previously fishing for Bass. Anyway back to the fishing, Pat and myself were on location first, I decided to take a few random underwater pictures as visibility was fantastic. 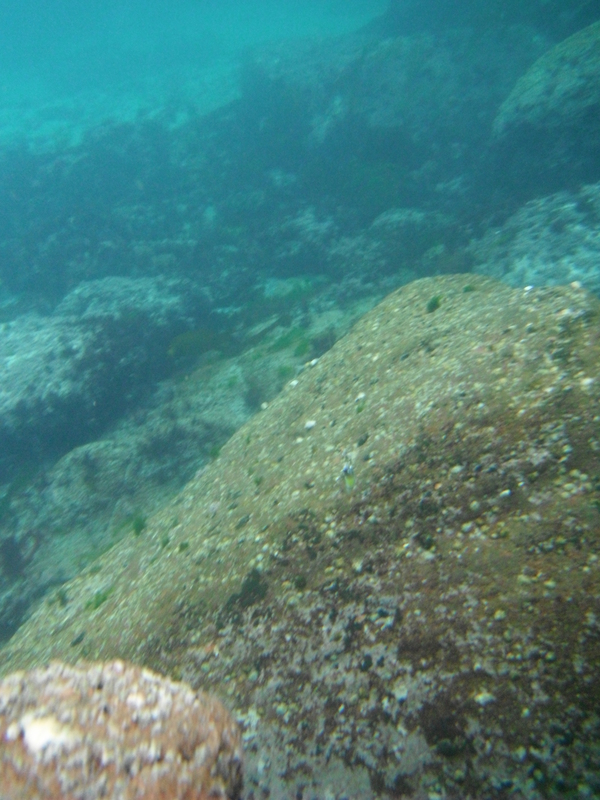 Here is one of the pictures below, I managed to capture a fish on one of the shots can you see it? 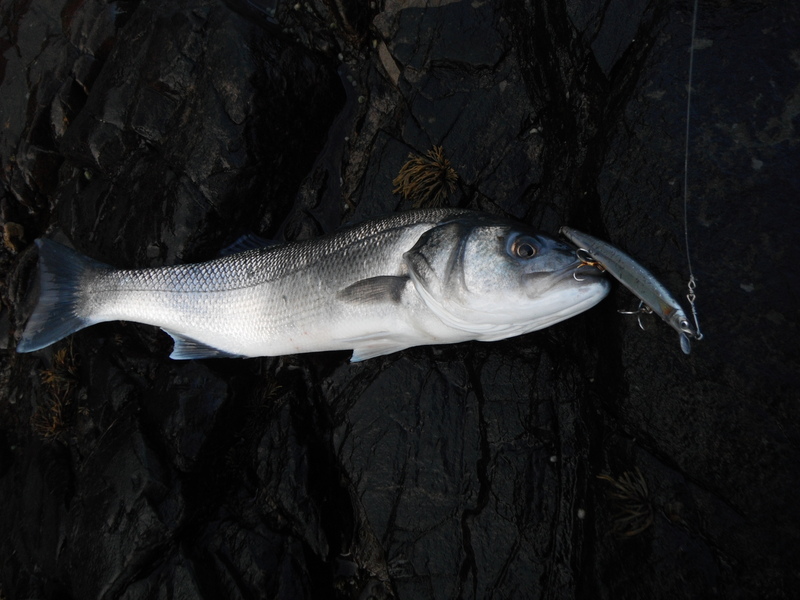 The fishing was slow, the tide slowly pushed in creating some activity. Crevan and Tom joined us. 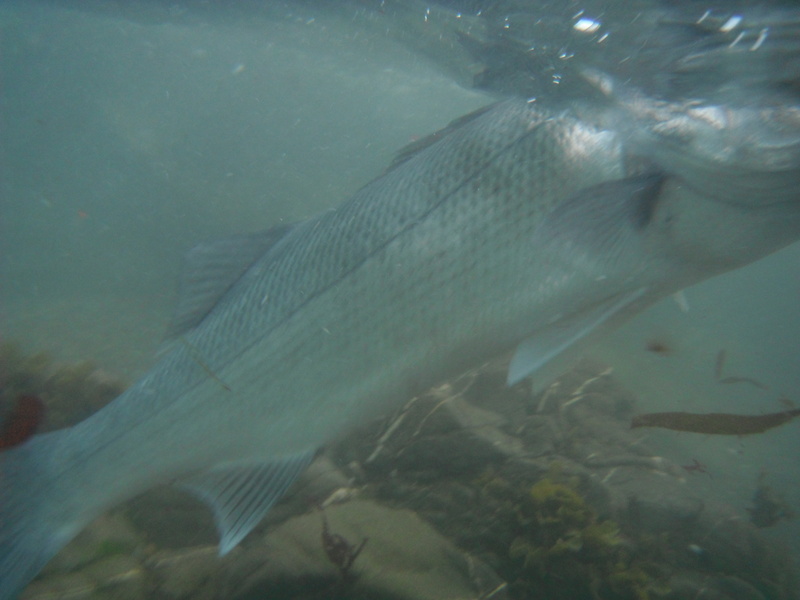 During the session we seen a shoal of mullet, 3 shoals of sand eels and 5 or 6 Bass swimming mid water together in about 10 feet or water directly below us. We all just stood there like rabbits in a head light watching there electric blue backs glide out of sight. Epic. 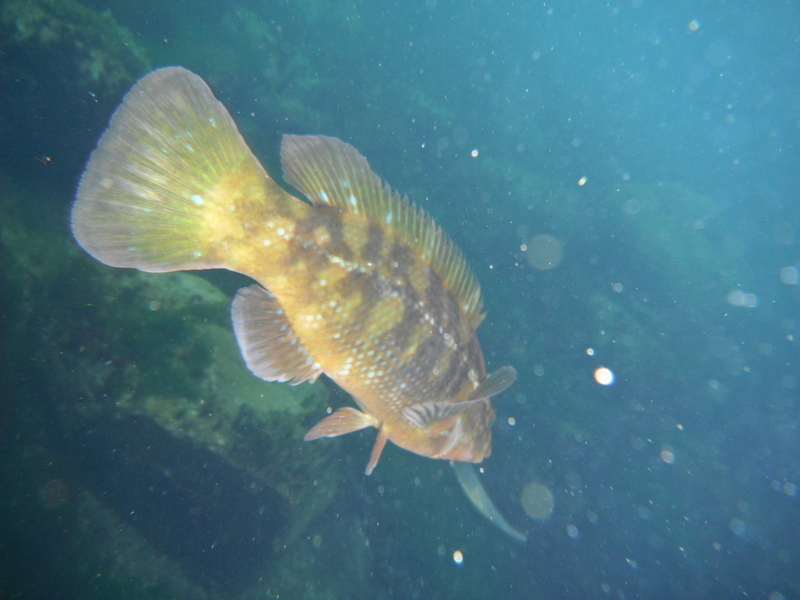 It was about time a fish was caught, so in between losing jig heads I finally felt that unmistakable Wrasse pluck as my SP swung behind a large submerged ledge. I waited and then struck – Fish On 🙂 It gave a nice little scrap Happy Days. 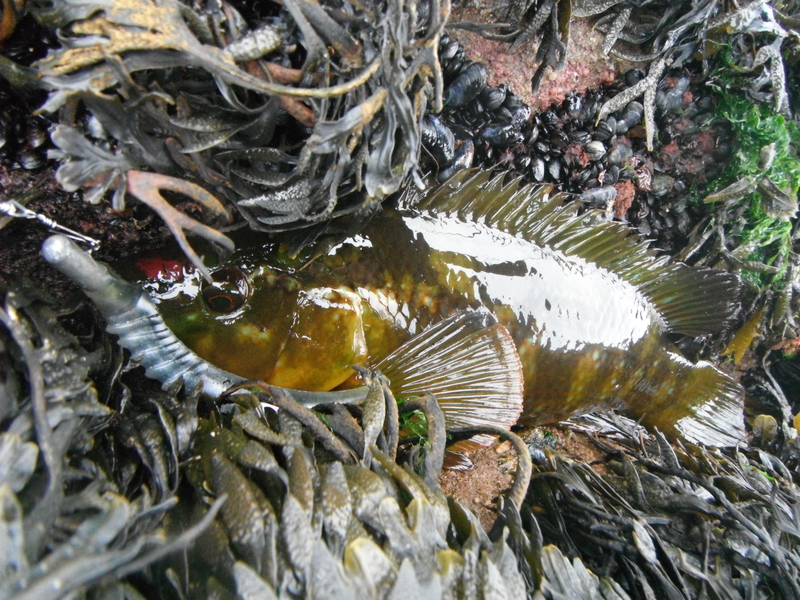 First Wrasse of 2012 coming in. I tried to get a video of its release but it was too quick for me ! That was all of the action for the morning, Pat had his SP robbed by a suspected Wrasse at one point but apart from that it was all quiet. We called it a day after a couple of hours.